B informed me she wanted some thing festive and fizzy this afternoon. After a bit of mouth-agape monkey-trying-to-solve-a-Rubik’s-cube thinking, she reminded me that she had found a recipe for a drink called a Kir Royale 38. Loyal readers of the blog (and other mythical creatures) will recall that we have already done the Kir Royale. B found this more obscure riff on that cocktail in a 1999 New York Times article written by William Grimes called “The Aperitif Moment: Sip or Flinch“. According to Grimes, the Kir Royale 38 was developed to celebrate the 38th anniversary of the legendary (the Kennedy’s used to hang out there) and now defunct New York restaurant La Caravelle. Pour the cognac and Grand Marnier into the bottom of a champagne flute. 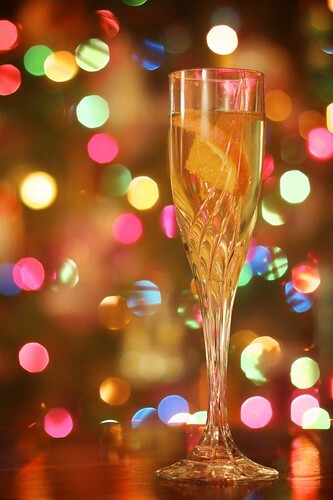 Fill glass with champagne and garnish with the orange slice. As a side note, you really need Grand Marnier as Cointreau simply makes the drink too sweet. Both B & I enjoyed this festive and fizzy drink that seems to be ideal for holiday drinking and entertaining. I think we both still like the original Kir Royale a little better, but this version makes for an enjoyable alternative when you want to change it up a bit (or your don’t have crème de cassis).